Black Water Rafting See the glow worms shine as you drift downstream through the caverns. Glow Worms Experience the wonder of millions of glow worms in an enormous cavern. 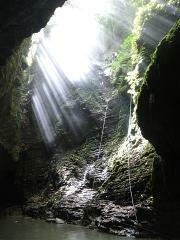 Kiwi Cave Rafting provides everything required for the adventure (wetsuits, helmets, boots and safety equipment). All you need to bring is your towel, extra pair of socks and a swimsuit. Once you have completed your tour your can enjoy a nice hot shower then warm up with a complimentary cup of hot soup. Great photos are taken by your guide during the trip allowing you to sit back enjoy the scenery and have the best experience possible. These can be purchased upon completion of your tour. Pickups: If you do not have your own transport we can pick you up from locations in Waitomo Caves Village or along Waitomo Caves Road only. sole discretion of Kiwi Cave Rafting.